Wake up. Yawn. Scratch. Avoid cat. Pour coffee. Drink coffee. Brush teeth. Think about the bulldozer. Surely there's something fun to do here? Ivo Vor thinks so. "The Brunch is a series of consumer products that celebrates the mundane," says his website. In response, you may find yourself thinking, "But it's breakfast. How much fun can that be?" Well, quite a lot really. First things first, let's make the tea. The teapot measures the height you can pour tea from, while the milk and sugar are measured to astounding accuracy. The neurotic cutlery turn invisible if you look at them the wrong way, and the precision bread slicer holds your bread slices to be exactly the right thickness to put in the toaster-catapult. 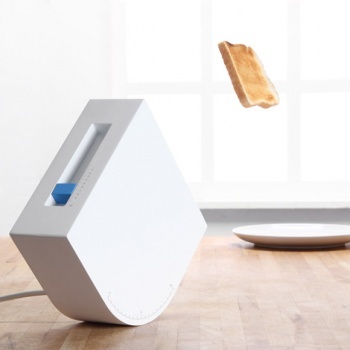 Yes, the Wii-inspired toaster, which thanks to its 42Â° angle and 5.2N of force, can hurl your freshly-browned toast across the room to land on your neurotic plate. But toast gets cold quickly, so designers Ami Drach and Dov Ganchrow have invented a warming plate, for which they obviously took inspiration from the defrosting capabilities of a car's rear window. The plate has "silk-screened gold and amorphic metal films" embedded in its surface. This enables the 12V plug-in plate to heat up and keep your chosen food warm. Sounds wonderful, doesn't it? Unfortunately, all of these items are only prototypes at the moment, so it's back to the same old pancakes, grits, hash brown, and sausage for you.